We are living at a time where change is ensuing at such a pace that it can be difficult to absorb what’s actually happening around us. Technology alone is evolving so fast that by the time we get used to doing things one way, a new way has already been launched. A state of overwhelm and anxiety during this Age of Change seems to be the norm and is one of the greatest challenges facing organizations and individuals alike. Despite change and disruption being a constant in today’s world, there are also those who are quite comfortable with this reality and are managing to truly thrive. What is it that helps these people navigate change in a positive and effective way? They all share specific traits that help them better adapt to and navigate what life throws their way. For those that are finding it a struggle to keep their heads above water during these turbulent times, there is good news… These traits can be developed and everyone has the capacity to build a positive relationship with change. Having a clear understanding and acceptance of your core assets: (Your Values, Personality Traits, Skills, Weaknesses and Passions) helps develop the clarity and confidence to know who you are and what you are able to bring to the table in confronting change and adversity. Clarity and confidence here can be best summarized as self-efficacy. Psychologist Albert Bandura has defined self-efficacy as “one’s belief in one’s ability to succeed in specific situations or accomplish a task”. One’s sense of self-efficacy can play a major role in how one approaches goals and tasks. Gaining self-knowledge is a necessary step towards self-efficacy and is integral to being able to better navigate change. Lacking belief in ones own abilities and the knowledge of how those abilities can be utilized and leveraged, often leads to resistance to and difficulty in adapting to change at some level. Let your authentic self and core assets guide you through change and trust in what’s inside of you. 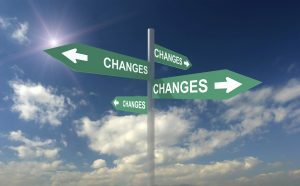 Connected with the new reality of constant and rapid change, is a heightened state of uncertainty on many levels. With change comes uncertainty, and as such, developing a tolerance of uncertainty becomes crucial to developing change resilience. Shining a light on and accepting the areas of life in which we don’t have answers and/or have little to no ability to influence the outcome allows us to move past resistance and unproductive worry and enables us to address the things that we are able do something about including during times of change. Let’s face it, none of us prefer uncertainty, but the fact is we are all better off accepting it than fighting it. Having hope is key here. A hopeful person believes specifically in his or her own capability for securing a successful and fulfilling future amidst the absence of certainty of outcome. Moving from a mindset of resisting the unknown and trying to control the future to embodying hope about the future is a shift in perception that is helpful in moving past the dilemma of uncertainty. The latter capitalizes on a positive mindset of non-attachment allowing adaptability and flexibility, where the former capitalizes on fear and attachment resulting in rigidity and immobility. Our ability to come to terms with and find peace in uncertainty enables us to better confront and ultimately openly welcome change and adversity. A commitment to lifelong learning is about staying open, curious and adaptable. Those that are committed to their own growth not only seek out opportunities and learning, but have a knack for finding those hidden gems lying beneath the surface during times of change. During the process of change we will inevitably lose something and yet be confronted with an opportunity to create something new. Making self-development and growth a priority in life helps us more effectively embrace the new opportunities that change provides and let go of that which no longer serves us. Change resilience is inherently linked to and dependent upon healthy risk taking: stepping out of our comfort zone, welcoming new experiences and embracing challenges. Tapping into the wherewithal to move forward and take chances despite having fears of doing so, allows us to test and further develop our capabilities as well as build confidence and courage to pursue our goals and face life’s challenges. For many, the greatest block to taking risks is a fear of making mistakes and experiencing failure. I often tell my clients: Let yourself be human and allow mistakes and failure into your life vocabulary. The most successful people in the world have all experienced failures along their journey, and despite that, still managed to forge ahead towards the accomplishment of their goals. Mistakes and failures are inevitable, but, how you perceive them and what you do with them is a choice. These change resilience traits are not only key to surviving and thriving through change, but are also important components of living a purposeful and fulfilling life. By making change your friend, you also make life your friend, and by doing so, increase your capacity to adapt to and overcome the adversity and challenges that life presents. Do you know what you want?…What You Truly Want? © 2019 Authentic Path. All Rights Reserved.